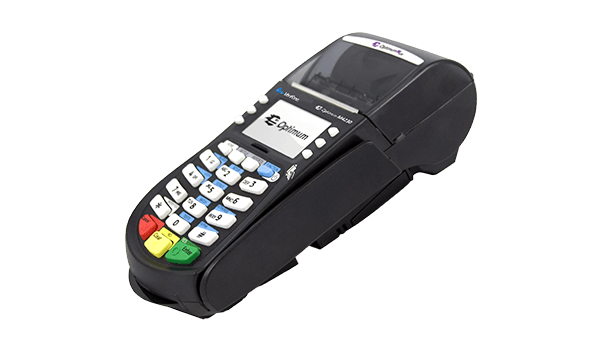 The Hypercom Optimum M4230 is a wireless credit card terminal that is ideal for fast paced, high density environments. With a large memory, fast processor and a secure design that meets today’s strict security regulations, this device has the capacity to handle the most stressful of situations. The large keypad allows for easy key recognition and a heightened ease of use. The SureLoad thermal printer design eliminates paper jams and saves time by allowing for a larger paper roll, so there are fewer roll changes. A smart alert system notifies the owner when paper is running low, ensuring that transactions are processed seamlessly. The M4230 accepts all types of payments, including EMV. Versatile and flexible, this unique device adds mobility and productivity to all kinds of businesses. Its long lasting battery and user-friendly design makes it perfect for use at vendor stands, sporting events, delivery services and more. At Firemane, we have used and refurbished Hypercom POS products available for bulk purchases, with a 12-month warranty for all refurbished units. We supply all members of the Hypercom Optimum family. Get in touch with us to order refurbished and used Hypercom Optimum M4230 POS terminals today.